We can call System 2, our cognitive intelligence, one of our “modern” challenges, it is much newer than System 1 (instinct, emotion) in evolutionary terms. Just 4% of our DNA is different from our closest cousins, the chimpanzees, but this portion includes important changes in our forebrains, or perhaps we should say our “foresight” brains, with their planning and executive functions, and the other parts of our cortex that process complex language, and give us detailed self-consciousness. Other animals have complex emotional and social intelligences. Those aren’t unique to humanity. What makes humans unique are few critical refinements in System 2 (deliberation, cognition), which allowed us to wake up, start aggressively using technology, and walk out of Africa across the planet some hundred thousand years ago. That is a very short timespan in evolutionary terms, and so System 2 remains quite weak and easily overwhelmed. Our ability to use serial logic, thinking, and planning is quite limited. We can keep an average of seven things in short term memory simultaneously. That buffer isn’t very big, but it has allowed us to accomplish a lot. Yet all our deductive and logical thinking pales against our vastly more advanced parallel and associative inferential thinking. Our higher, or self-consciousness is also fleeting during a typical day, so we spend most of our System 2 activity running subconscious, previously learned routines. This argues how important it is to learn the right routines in our youth and young adulthood. A 1990s study at a major university (that I need to track down) proposed that we have approximately 20 minutes of fully introspective (self-aware) consciousness in a typical day, in intervals of a few seconds to tens of seconds at a time. The rest of the time we operate in our subconscious systems, which are even more weakly deliberative. We “wake up” fully only during those conscious intervals, and we lose consciousness for a third of our life every evening. See Leonard Mlodinow’s Subliminal (2013) for a good recent summary of this research and its implications. Improving the quality and generality of our consciousness has been a goal of the neurotechnology community for several years now, and new wearable technology and biofeedback tools, in combination with better neuroscience, may finally get us there. With luck and good foresight and entrepreneurial action, we’ll see some clinically validated tools on that front in coming years. 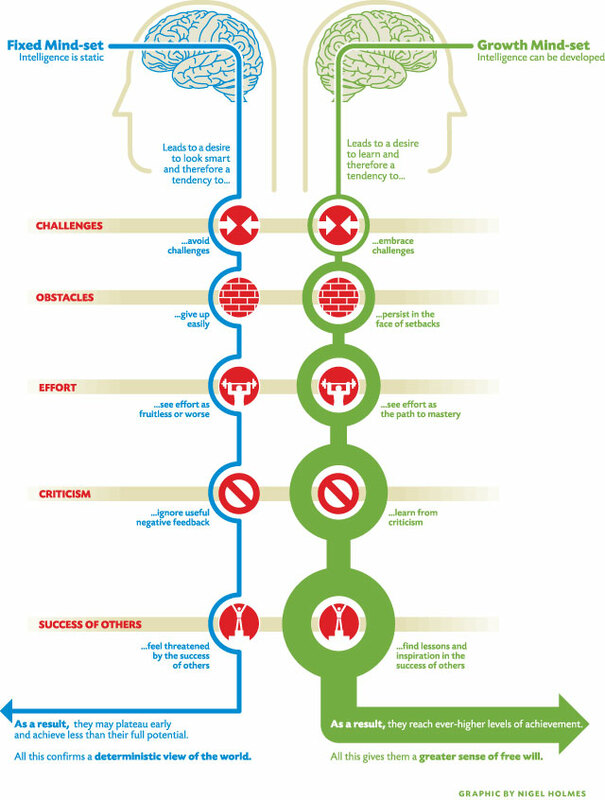 One foundation of good emotional-cognitive intelligence is adopting a Growth Mindset. As psychologist Carol Dweck explains in her groundbreaking book, Mindset: The New Psychology of Success, 2007, there are two classic types of beliefs about our personal futures: fixed and growth (picture below). In the fixed mindset, we believe our psychological traits and our general skill capacities are mostly fixed at birth, and so we attach our emotions to comparisons of our “static assets” relative to others. In the growth mindset, we realize that both our traits and skills can either improve or decline over our lives (positive or negative growth), based primarily on our personal choices, activities and circumstances. With regard to our skills, as Dweck shows, what we want to praise or censure (give feedback on) is not our relative position with regard to other skills, but rather the efforts we, our children, and others make to improve our skills, and the growth or change we see from our last assessment. This focuses our emotional energy on growth behaviors and outcomes we can control, not those outside our control. We also come to see challenge and failure during effort as learning opportunities. With regard to our talents, some newer research shows that what we want to praise or censure is not the effort being put into changing traits, or even the good behavior, but the person themselves for having that trait, as a way to bring out more of a desired trait. For example, if your child (or colleague!) is at the 20th percentile of conscientiousness (organized, determined), to pick one Big Five trait at random (we could use any trait assessment for this point), you might want to praise them as conscientious individuals for any conscientious acts you see, changing their self-perception and strengthening that trait. If they are the 90th percentile of agreeableness (accepting, cooperative) and thus often seem too agreeable, and not critical enough, you might question a quick acceptance behavior, and ask whether they have unexpressed criticisms or judgments they haven’t aired. In this case, it isn’t effort or even behavior, but who they presently appear to be, relative to others, that is the key thing being praised or questioned, to help traits move in more adaptive directions. See more on applying these two approaches at Greater Good, an excellent UC Berkeley repository for ideas on fostering growth, gratitude, altruism, compassion, empathy, forgiveness, happiness, mindfulness, and other positive values and traits in our children and others. As a closely related emotional-cognitive activity, we must learn to build appealing, detailed, and achievable positive visions of our near and far future selves, to aid our growth activities. Our visions are always in a productive tension with our recent history of growing, or not, toward our envisioned goals. For more on the latter, see Daniel Goldstein’s TED talk, The Battle Between Your Present and Future Self, 2011. Building appropriate visions also requires seeing and adjusting for our emotional and cognitive biases, a topic we’ll discuss in the next subsection. Now, let’s turn briefly to our most purely cognitive, also called analytical, intelligence. The intelligence quotient (IQ) is a set of standardized tests used to measure various analytical aspects of intelligence, including logic, abstract reasoning, memory, planning, problem solving, spatial reasoning, reading, emotional knowledge, and general knowledge. Such tests are not without flaws, but they are reproducible, and have been in use in various forms since 1905. The Flynn effect, named after researcher Jim Flynn, is the observation that our general IQ scores have been rising three points per decade since the 1930s, all over the world. This means the standard IQ tests have to be periodically renormalized, to keep the average score as 100, with a 15 point standard deviation. What has caused this long-term increase in our analytical intelligence (System 2), and has our emotional intelligence (System 1) also improved in a similar manner in recent decades? We don’t seem to have good answers to these questions yet, but there are clues. As Flynn explains in What is Intelligence? (2009), subsets of IQ that deal with vocabulary and arithmetic show virtually no change in recent decades—our literacy and numeracy levels are relatively stable. But our average population scores on conceptual similarities and visual reasoning portions of IQ are far higher today than in the 1930s. Flynn mostly blames the incredible recent growth in System 4 (technological intelligence) as the primary driver of increasing IQ. Most of us don’t read or do more math than our parents, but we watch far more visually complex material, and engage in more complex visual and spatial tasks than in previous generations with our technologies. The smartness and intensity with which we use our technologies will only continue to accelerate, further raising our average IQ. We can also see ways to use coming free 24/7 educational technology (teacherless education, the wearable web, digital twins, groupnets, etc.) to greatly improve all our other intelligences. System 4, especially when we broaden our focus to also include entrepreneurship, economic and social technologies, is increasingly our most powerful lever to improve the world. Of all five systems, it grows the fastest by far, as we’ll seen in Chapter 7. In today’s early generation of social networks, our System 3 (social intelligence) may not yet be more complex than in previous eras. In fact, when we look at how people use their digital devices today, there may be a first generation regression in our in-person social awareness and sophistication, as a cost of the growth in our online social sophistication. This regression is a Kuznets curve process. It is a common feature of many early technologies. It is so common I call it a fourth “law” of technology, stated briefly as: “The first generation of any technology is often dehumanizing. The second generation is generally ambivalent to humanity. The third generation, with luck, becomes net humanizing.” Fortunately as our science and technology continue to improve, our digital tools will be able to make us better in person as well as online. The future of social intelligence looks very bright. Flynn also notes that our society and its media are increasingly scientific and evidence-based versus previous decades, which he proposes as another key cause of our steady rise in average abstract reasoning abilities as measured by IQ scores. This contribution is a growth in complexity of Systems 4 and 5, our total environmental intelligence, including technology. Both of these are where we have the greatest potential for growth. The better we use our accelerating tech, and the more we understand the hidden and expressed complexities and tendencies of the universe, the smarter and more adaptive we become. This and other research tells us our intelligence has both genetic and environmental components. If you’d like to improve any dimension of your intelligence, because you think it might help your life or career, you can find tests that measure that dimension, expose yourself to environments and practices that will build it, and chart your improvement over time. Traits are hard to change, but your environment will express or inhibit them, and no trait is ever set in stone. That’s the beauty of having a brain with 100 trillion unique synaptic connections. Your brain is the most complex system in the known universe, a constant learning machine. As individuals and as a society we’re increasingly learning how to aim it, and challenge it with the right environment, so it will improve. With regard to assessing and training your System 2 IQ traits using System 4 (technology), there are many places online that offer free IQ tests, if improving abstract reasoning is a particular interest, as it may be for some. There are also a number of emerging brain games sites that offer focused practice on tests of mental abilities like memory, attention, flexibility, and speed of processing. All of these mental abilities, as you might imagine, are key aspects of IQ, or our general problem solving ability. Some of these platforms will also rate your performance on these traits/skills relative to others of your age, which can motivate you to practice more. Daniel Goleman’s recent book Focus (2013), argues that attention may be the most critical cognitive resource for personal performance, but I’d argue that working memory, creative flexibility, and the drive to continually solve problems are equally important. Since the early 2000’s, neuroscientists and cognitive psychologists have known that even such developmental features of our brains as our attention, visual awareness, and working memory are still surprisingly fluid. All adult brains have what is called neural plasticity, which lasts for our entire lives and can be maintained by good diet, exercise, and mental practice. Improving our mental potential via so-called brain games is a young field, and one where a lot of false claims have already been made, so we have to be careful not to overclaim. But science is clearly showing our ability to maintain lifelong brain plasticity with strategies like a good diet and regular exercise, and to use neural plasticity to significantly improve our mental function in these areas, at any age. We also know that even small differences in mental function can add up to huge differences over a lifetime. DriveSharp, a visual attention & speed of processing brain game by Posit Science. 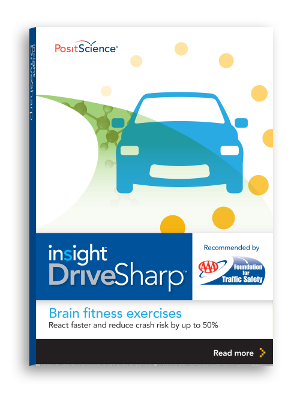 Consider DriveSharp, by neuroscientist-led startup Posit Science. After just 20 hours of practice with the DriveSharp game, 60 year olds greatly widen their fields of visual awareness, and even speed up their reaction times, and these training effects apparently persist for up to twelve months before another refresher set of practice games (20 hours or less) are required. How valuable is greater visual awareness? According to Posit Science, their cohort of DriveSharp-trained elderly individuals cut their auto accident risk by up to 50% the following year. As a consequence, DriveSharp is now available for $49 through AAA. Eventually such games may be a required part of continuing driver education for older drivers. Cognitive neuroscientist Torkel Klingberg, working with children who have memory deficits, has shown that 45 minutes a day of playing a special brain game that pushes them to the limits of their working memory, five days a week for five weeks, improves their working memory by 15-20%. That is a small number but a huge advance, as it changes the level of planning detail you can keep in your head, any moment in time, for every waking second of your life (and perhaps in your dreams as well). Educating folks to know, track, and improve their working memory, just as they do with many other less important numbers regarding their health, would have a big performance payoff. Educating folks to know, track, and improve their working memory, just as they do with many other less important numbers regarding their health, would have a big performance payoff. 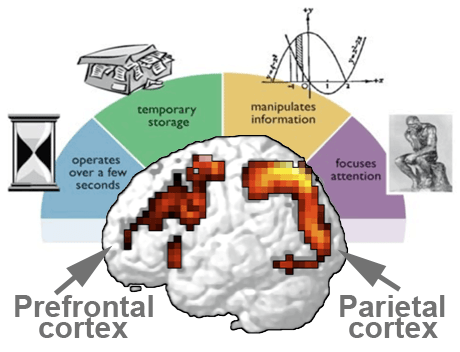 Cognitive psychologist Mark Ashton Smith, developer of the brain training and IQ development system IQ Mindware, has a nice graphic (right) which shows some of the areas affected by a good brain training system, and some of the ways they influence mental performance. How much daily practice we need, to first build and then maintain any new brain capacity, will depend on our age, the training system, and the specific capability we are seeking to improve. With respect to working memory, my amateur survey of the literature leads me to think that middle aged or elderly adults would need on the order of at least 45 minutes a day of daily hard mental practice, five or six days a week, to both grow and maintain both expanded working memory, and other improved mental capabilities like better focus, attention, and perceptual awareness. It might take adults a lot longer than five weeks to see the gains, but I’d bet they would come, as long as the brain games are smart enough to push us to the limits of our abilities for most of the training time. In brains, just as in muscles, too little and too easy practice will not improve or maintain our potential. 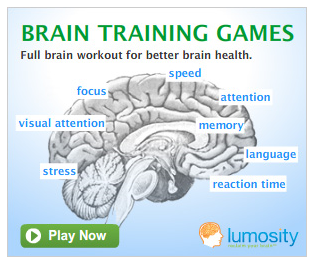 The current market leader in brain training games is Lumosity.com. Lumosity guides us to do practice in a variety of mental capacity areas (see picture right) for 15 minutes a day. I don’t think they’ve got good data on the 15 minutes of practice being of much value. I’d bet they are using this number because that’s the most time investment they could realistically expect from the average busy person. Let me know if you hear otherwise on this point. In my experience, if you play their games for 45 mins a day, your performance on a variety of subsets of cognitive intelligence will rise, plateau for a while, then move up again, in a series of S-curve steps. This is the normal mass practice learning dynamic. I’ve found the subset of their games that improve your attention, working memory and visual awareness will lead to noticeable (by you at least) improvement in your daily workplace performance. But as a cognitive aid, Lumosity still leaves a lot to be desired. While people who love playing casual games might spend 45 minutes a day with Lumosity for life, most of us are not that kind of person, and could never justify the time. It would just have too low a payoff in our careers. So what kind of brain training do modern professionals really need? If you are wondering what kind of system most of us would find sufficiently meaningful and motivating to work with for 45 minutes or more on a daily basis, see our Computer Adaptive Continuing Education (CACE) entrepreneurial idea in Chapter 10 (Ideas for Builders). We need a Lumosity-style system that we’re using to simultaneously learn useful things, helpful for our careers. That’s worth spending 45 minutes or more with every evening, for the rest of your life. If that future vision strikes your fancy, share it around. Someone will eventually build it, so that we can all benefit. Another foundational group of emotional-cognitive skills are Toffler’s three foresight skills of anticipation, innovation, and strategy. We’ve said a lot about these throughout the Guide, but let’s look more closely now at the third skill, strategic thinking, from the perspective of both emotion and cognition. Perhaps the top strategic thinking subskill that most of us need more of is better ability to prioritize. As with many things, your cognitive abilities (System 2) help you set priorities, and your emotional abilities (System 1) either work to support that prioritization, turning it into execution, or they block it, so you deprioritize and get distracted by other things. As the late Stephen Covey reminds us in his prioritization classic, First Things First, 1994, life is a series of important moments and urgent moments. 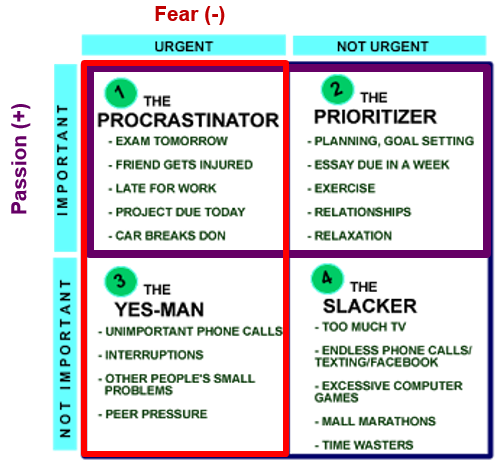 We spend our days moving chaotically between four basic time allocation quadrants, two of which are important quadrants, and two of which are urgent quadrants, and one of which is neither (picture below right). The art of time management is about staying passion-driven, being emotionally positive and calm, not manic, fatalistic, or fearful with our instinctual System 1, while staying vision-driven, pursuing our best strategic priorities, using System 2, as much as possible during our day. We want to drop into urgency (fear) in System 1 only for short sprints, and ideally under the control of System 2. In Covey’s model, in the matrix right, you want to spend as much daily time as you can in the Prioritizer’s quadrant, doing things that are important but not urgent. Life’s daily emergencies, interruptions, and contingencies will push you many times each day into being a Procrastinator (slipping back to less important things). They will also force you to be a Yes-person (sucking up to others urgency or fear signals, doing things that really aren’t important for you or the team) and a Slacker (a waster of your time and energy). With regard to the latter, we all need downtime for renewal, recharging, recovering our energy every day, and larger amounts every week, quarter, and year. But once we’re truly relaxed and re-energized, there are always sharply declining returns to every additional day or hour we spend in recreation. At a certain point, when we aren’t asking if we still want to relax, we find we’re not doing what we intend to do, but are merely “slacking off”. System 2 is “checked out,” or distracted. We are wasting our precious mental and life energy on things we don’t truly desire. If we are paying attention to where we are in these quadrants at multiple points throughout the day, we can quickly get back to self-leadership, reengaging System 2 and reprioritize ourselves, so we can execute better actions over the next stretch of time. These are all key strategic thinking skills in the personal foresight domain. An ideal time to get reprioritized is after any break, before you sit down again to work. That means the first hour or two after rising in the morning (after your long sleep break) and the first half hour or so after any work break, meal, exercise, or social break, just before you start work again. These are great times to use your surplus of willpower and attention to look over your priorities, pick the most important (not urgent) and spend your first time on one of those projects, rested and refreshed. You may soon be forced by urgent events into a reactive mode, or may slack off into web surfing or some other low-value thing, but you’ll always begin your work sessions accomplishing something particularly important and valuable. You’ll also learn how to take brief breaks when you need them, and contemplate the next big important thing you’re going to do while you are on the break. These quadrant-navigating skills will put you back in control of your time and energy, even on days when you are forced to spend most of the day putting out fires and responding to others urgencies. When we are prioritizing, we also want to look for ways to do multisolving, using System 2 to find single strategies that will solve multiple important goals at the same time. This strategic thinking skill is sometimes called “killing two birds with one stone”, but multisolving is a simpler and more accurate name. With good use of System 2, and by challenging your team to help you do this, you can occasionally advance three or more high-value agendas at the same time with a single strategy. Keeping all your most important strategic goals in mind, and adequately imagining all your realistic options is key to determining if any multisolving strategies are available. Note that multisolving is not multitasking, which is doing two or more things in parallel, rather than sequentially. Multitasking usually is to be avoided, as it requires having to juggle and rapidly switch between several tasks at the same time. Every time you have to switch tasks, there is usually an emotional (willpower) or cognitive (onramping) switching cost. Better strategy and planning will often show you how to get away from having to multitask, allowing you to spend focused time on each key project in serial fashion, moving the ball measurably forward on each before turning to the next project. The traps of deprioritizing (distraction), and simple solving (focusing on less-important but simple, single-goal tasks because you need an emotional boost, to “get something done”) often happen when you have been procrastinating, Yes-personing, slacking or multitasking too much, and have low willpower. Deprioritizing also happens when you’re just plain scared of the thing you should be doing, and aren’t facing up to that fear. Fortunately, your various System 1 and System 2 trait-skill complexes can all be improved. You just need to learn where you are, see better strategies, do something about it, and review your progress, in a personal Do loop, and application of the Eight Skills. In the process, keep improving the quality of System 3, by associating with the right people, and of Systems 4 and 5, your technology and scientific understanding of your environment, by regularly reading or listening to good books on the lastest psychological literature, and devising personal experiments. 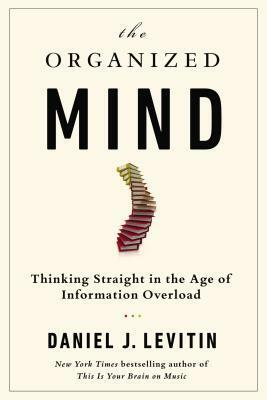 Books like neuroscientist Dan Levitin’s The Organized Mind (2014), offer useful tips for how to navigate our information rich society, by strengthening and tuning your attention, memory, emotion, and thinking processes, so that better foresight naturally emerges. See Tom Rath’s Eat Move Sleep (2013) and Thaler and Sunstein’s Nudge (2009), for more great tips on smarter habits and building a smarter physical environment. Returning to System 4, our accelerating technological intelligence, better behavior change environments are now emerging all around us. As early versions of groupnets (high-bandwidth voice-accessible connections to other people and the cloud, via wearable computers) and digital twins (software agents continously building maps of your values and recommendations based on those maps) appear in the coming decade, personality and trait work will be far more accessible to and practical for everyone who wishes to do it. For emerging digital tools for building an accurate self-model and personal goals, and getting detailed feedback on behavior, see the Quantified Self community. Good luck improving all your intelligences, and please share what you learn. The future of intelligence, from personal to global, is very bright.